We design and manufacture Chemical Earthing Compound also known as Mador Booster, Earthing Compounds, and Fast Discharge Earthing Compound etc. The basic purpose of the mineral filling compound is to reduce electrode to soil resistance and to create a low resistance zone surrounding the electrode to provide a uniform environment so that the electrode output is constant. 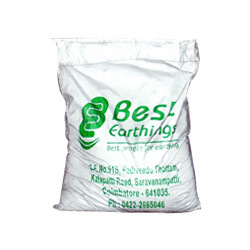 Use of salt & charcoal is eliminated in the method of effective Earthing & instead a specially developed, natural ecofriendly material with improved properties is used. Our earthing equipment is a groundbreaking and hard-wearing answer for the safest grounding system. The range is accurately designed to reduce the soil-resistivity of grounding system. Our earthing electrodes require less real estate and fewer electrodes to suit the specified resistance. Powered by Eliud Infotech Pvt Ltd.